A drive assisted slitter is designed so that the slitter motor is used to help push material through the downstream process. 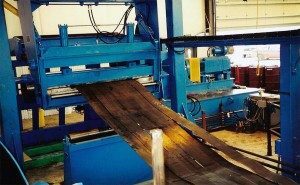 In this setup the speed of the shear knife is synchronized to the material strip speed. With this method it is best used for heavy gauge slitting and slitting of materials with low shear stress ratings. Scrap handling systems (Cutters, choppers, bailers, or scrap winders). Element has provided slitters with variable material penetration and a wide variety of incoming material shear stress ratings. 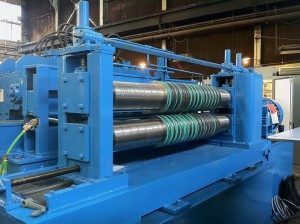 Our Slitting lines have met a wide variety of multiple applications they have also been used in different industries as well as have been built with the following options.